Chaldean Patriarch overjoyed at release of nuns and children, “they are well"
Mar Louis Raphael I Sako delivers some "good news" in a country torn apart by war, violence and division. He explains that "contact" was made by "the people of the city" who contributed "to their release”. No ransom was paid. They have returned to Dohuk, Iraqi Kurdistan. IRAQ, Baghdad (AsiaNews) - "I am overjoyed at the release of the two sisters and three orphans" because it is "finally some good news" in a context of war, violence and division, the Patriarch of the Chaldean Church Mar Louis Raphael I Sako tells AsiaNews. He was commenting on the news of the release of Sister Atur, Sister Miskinta and the three young children who were seized on June 28 last. Their captors were linked to the Islamic State of Iraq and the Levant (ISIS, Sunni jihadists linked to al-Qaeda), which now declares itself the army of the Islamic caliphate. 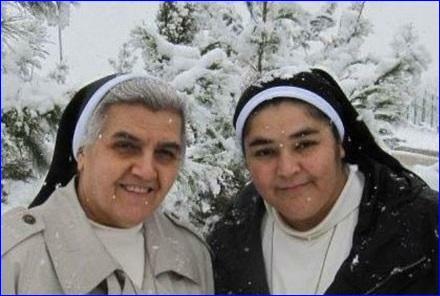 The two Chaldean nuns belong to the Congregation of the Daughters of Mary Immaculate which ran a foster home for abandoned and orphaned children in Mosul, near the Chaldean Archbishopric. Speaking to AsiaNewsHis Beatitude confides his “joy” at the “good news”. The Patriarch explains that “contacts were established by the people of the city”, who helped “in obtaining their release”. The sisters and the orphans, adds Mar Sako, were held “in a house in Mosul, but they were treated well, they were all together. The sisters feared for the safety of the girls, but there were no problems”. The Chaldean Patriarch said that the sisters spent “17 days of captivity praying for their release and for peace in Iraq.” According Mar Sako money was not paid in exchange for their release, but the Islamists ” just took their car, a new pick-up”. “The sisters are relieved and happy – says His Beatitude – they have taken their personal belongings and returned to Dohuk,” in Iraqi Kurdistan, where they found refuge on having to flee their convent. The news of the release of the nuns, however, comes amid a climate of war, divisions and violence. Parliament is seeking a difficult mediation between the various fronts, but aspirations for autonomy – particularly in Iraqi Kurdistan – are becoming stronger.